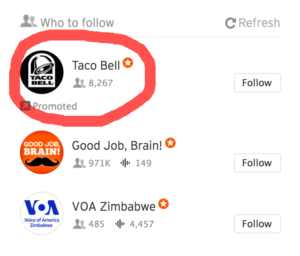 Taco Bell has a SoundCloud account? What do you think they would play? (Yeah, I should probably listen to their channel before I write about it, but let’s first speculate what they could be playing, because that’s more fun). In the past 11 months, Taco Bell has reposted five already-popular tracks. No new tracks. No undiscovered artists. No interesting podcast. Just simple reposts. Unfortunate. Taco Bell is just trying to be cool by reposting stuff, not creating or discovering anything new. They are branding these reposts as “Feed the Beat Fridays”. Odd, considering that there has been only five posts in 11 months. Maybe they delete most of their reposts? Or am I missing something? Maybe they post songs in other social media, but couldn’t get the rights for many of the songs on SoundCloud?